21 InnovativeHealthMag.com operation, maintenance or use of a motor vehicle. A motor vehicle does not include a motorcycle, but when a motorcycle is involved in an accident with a motor vehicle, No-Fault PIP benefits are payable. WHAT AUTO NO-FAULT INSURER PAYS PIP BENEFITS? The typical rule is that the injured person turns to his or her own auto No-Fault insurance company. There are several exceptions to this rule, such as persons driving employerprovided vehicles, motorcyclists, persons who do not have auto No- Fault insurance and other scenarios. ARE NO-FAULT PIP BENEFITS REDUCED BY OTHER BENEFITS? If a person purchases a “coordinated No-Fault policy,” No-Fault benefits are reduced by amounts other health insurers would pay on behalf of the injured person. This does not happen if a person purchases an “uncoordinated No-Fault policy.” In addition, if “governmental benefits” are payable as a result of the accident, No-Fault benefits can be reduced by those governmental benefit sources. WHAT ARE THE TIME LIMITS FOR PIP BENEFIT CLAIMS? A claim for No-Fault PIP benefits must be submitted in writing within one year of the date of the accident and must include the specific information required by the No-Fault Act. In addition, if any particular aspect of a claim is not paid, legal action must be filed within one year of the date that particular expense was incurred, or the right to enforce payment of that particular expense will be lost. A QUICK LOOK: THE TORT LIABILITY CLAIM WHAT IS A TORT LIABILITY CLAIM AND WHAT COMPENSATION IS PAYABLE? An accident victim may be entitled to compensation in a “tort liability claim” if the accident is caused by the negligence (i.e., carelessness) of the other driver and the victim is able to satisfy the injury severity requirement that is applicable to the claim. There are two types of monetary damages that are recoverable in tort liability claims: noneconomic loss damages, such as pain and suffering, disability, loss of function, denial of social pleasure and enjoyment, and other quality of life losses; and excess economic loss damages, which are payable for certain out-of-pocket expenses that are not paid by No- Fault PIP benefits, such as income loss not covered by PIP benefits. WHAT ARE THE INJURY SEVERITY REQUIREMENTS FOR TORT LIABILITY CLAIMS? Tort liability claims seeking recovery of noneconomic loss damages require proof that the at-fault driver was negligent (i.e., careless) and that the injured person sustained a “threshold injury,” which the No-Fault Act defines as a “serious impairment of body function,” “permanent serious disfigurement” or death. Tort liability claims for excess economic loss do not require proof of a threshold injury. WHAT HAPPENS WHEN INJURIES RESULT IN DEATH? Where a person dies as a result of a motor vehicle collision, a special kind of tort liability arises which is known as a “Wrongful Death Claim.” Wrongful death claims are pursued by the decedent’s estate on behalf of family members. WHO PAYS COMPENSATION FOR THE TORT LIABILITY CLAIM? Tort liability claims are paid by the insurance company for the at-fault driver. If the at-fault driver does not have liability insurance and the injured person has purchased “uninsured motorist coverage,” the victim’s uninsured motorist coverage will pay the claim. Similarly, if the at-fault driver does not have enough liability coverage to fully compensate the injured person, and if the injured person has purchased “underinsured motorist coverage,” the injured person can turn to this coverage for further compensation. IS TORT LIABILITY COMPENSATION REDUCED BY ANY FACTORS? A victim’s right to recover tort liability compensation is reduced by any negligence that is attributable to the injured victim. Therefore, if the injured victim is 20% responsible for the accident and the at-fault driver is 80% responsible, the victim’s liability damages will be reduced by 20%. However, if the victim is over 50% negligent in causing the accident, the victim cannot recover any compensation for noneconomic loss. 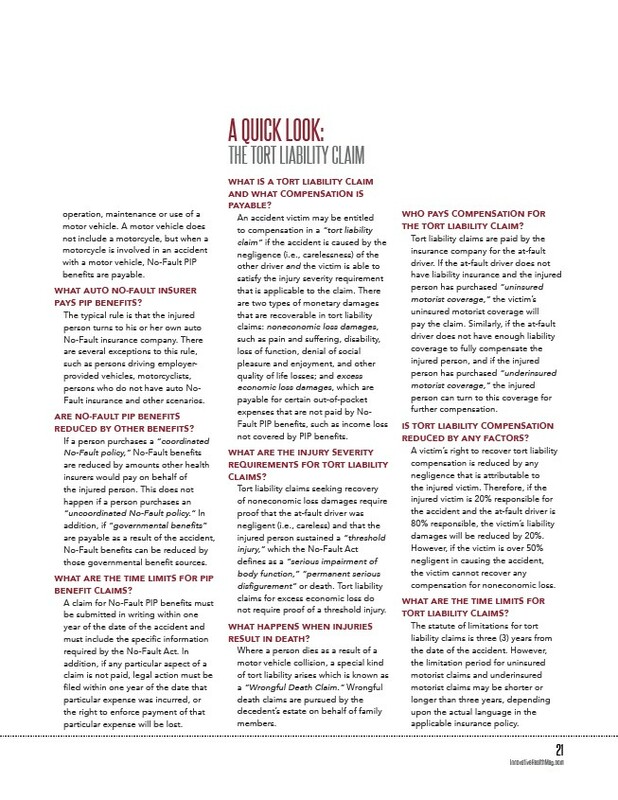 WHAT ARE THE TIME LIMITS FOR TORT LIABILITY CLAIMS? The statute of limitations for tort liability claims is three (3) years from the date of the accident. However, the limitation period for uninsured motorist claims and underinsured motorist claims may be shorter or longer than three years, depending upon the actual language in the applicable insurance policy.